As ex-Christians, one thing we’ve all had to contend with at some point is the asinine arguments of Christians in defence of their faith. Whether its arguments with Christian friends, family, or strangers on the Internet, anybody who is not a Christian has attempted (and most likely failed) to reason against the fervent, barely coherent nonsense that passes for most Christian apologetics. What I have discovered from online discussions and speaking to believers is that they always rely on the same old tired arguments, rarely, if ever bringing anything new to the table. With this article, we will look at some of the more common tactics employed by Christians attempting to debate or defend their beliefs in the face of scepticism and why these arguments fail. Probably the most common Christian debating tactic is to not actually address any direct questions. We’ve all seen it around here at some point: a Christian comes wading in, fists flying, cocksure and drunk on their self-righteous superiority. They know it all, they have all the answers, Jesus talks to them personally and tells them everything, so they just KNOW they’re right. So, you ask them a question; something that shouldn’t be too difficult for someone so enlightened to answer. A biblical contradiction here, a logical flaw in the very fabric of their beliefs there and… your questions go completely unanswered. In fact, you may as well have not even bothered asking it. Instead, they ignore you altogether and carry on flapping their cheeks. Not only is this tactic fairly commonplace, it is also very annoying, especially as Christians will usually insist that you address every single point they raise. Interestingly, this circumlocution tactic figures into how they address your responses to their questions too as, for the most part, unless you give an answer they want to hear, they will ignore what you have said and continue banging their drum, repeating their questions over and over again until you drop the discussion out of frustration. In an online discussion with a Christian, I repeatedly provided answers to his questions and he ignored every single one. I even posted links to articles and YouTube videos that addressed his concerns, but they were never acknowledged; and yet he continued to ask the same question over and over again. In the end, I had to terminate the discussion. It wasn’t going anywhere and this guy had no intention of listening to me. Picture this. You’re in mid discussion with a Christian, then all of a sudden, the unthinkable happens: you’re actually able to stop them from wriggling about and get them to focus in on a specific topic. Knowing they’re cornered, what do they do? Completely change the subject! The discussion is about the lack of historical evidence for Jesus, and after a brief silence, they respond with “…so you’re saying all this came from nothing?”. The discussion is about the unabashed barbarity of the biblical Yahweh, and they retort to the tune of “…so if god doesn’t exist, then where do you get your morals?”. You will often see this in debates concerning evolution, where the Christian will suddenly switch to abiogenesis or the aforementioned speculations on so-called “objective morality” (Christians LOVE that one). It’s infuriating. It’s like trying to watch a TV program with someone who keeps changing the channel, and it’s the last resort for the apologist who can’t stand the heat. “Oh, look at that over there!”, they say pointing over your shoulder, and when you look, they run away. Another favourite of the apologist, and one that works especially well in verbal discussions is to just keep talking. If you’ve ever watched any of The Atheist Experience videos online, you’ll see this a lot with their Christian callers. These people know they don’t really have much of an argument, so they just keep on talking to stop their opponent from getting a word in. They will interrupt you, talk over you and do everything they can to prevent you from actually making your point, stopping only to declare themselves the “winner” when they’ve finished. This one is a personal irk as I like to be civil in verbal discussions. I listen to what the other person has to say, but expect them to extend me the same courtesy, so it gets very frustrating when the civility is not reciprocated, and instead, I find myself being constantly interrupted by one rambling monologue after another. Christians know exactly what they are doing with this tactic as well. They know it can be disarming and that the never-ending barrage of speech can throw you and derail your train of thought. They also know if they actually stop and allow themselves to listen, they might be faced with something they don’t want to hear. Possibly the laziest weapon in the Christian arsenal. If you don’t have the intelligence to formulate a credible argument, simply quote the bible at your opponent! Again, it’s something else we see on here a lot. Drive-by apologists roll past, unloading a clip after clip of scriptural bullets from their “good book”. Unfortunately for them, it’s like a child shooting at you with a toy gun and shouting, “Bang! Bang! You’re dead!” in terms of its effectiveness. Christians like to quote the bible because they believe it to be the word of god and are therefore convinced that it is somehow powerful enough to silent all dissenters. However, much like the child in the previous paragraph, the potency of this particular weapon exists only in their imagination. This one is quite subtle mainly because the apologist using it is not even aware of what they are actually doing. Let me give you an example of what I’m talking about. Some time ago on another forum, religion came up as a topic when someone asked about the bible. I chimed in with my thoughts, basically summarizing some of the bible’s more unsavoury moments as statements of fact. The forum Christian then pounced on my post and accused me of making an “emotional appeal” against Christianity, which was strange as there was no anger or upset in my words. What he was in fact doing was projecting his own feelings on to what I had written. My criticism of his beliefs made him feel angry and upset, so he pushed those feelings onto me. They (Christians) are not at all interested in facts or evidence (which is already apparent by their beliefs) they just want to stop you from challenging them.You also see this in debates with Christians about the purpose of life. The Christian, and ONLY the Christian postulates that if their god doesn’t exist life would be empty, miserable and without purpose, yet they accuse the non-believer of leading an empty, miserable and purposeless existence even if the non-believer claims the opposite to be true! These people don’t seem capable of understanding that there are others who do not see the world like they do, and do not realise the extent to which they project their own irrationalities. They claim to be “free” and “happy” and decide that it is the atheist who is unhappy. They are like people in a cell, thinking those on the other side of the bars to be the ones imprisoned, when it is really they who are incarcerated. As there are so many of these, I felt it made more sense to include them under one category. What I am talking about here is something that is inevitable in every single debate you will ever have with a Christian. Again, as with most of the weapons in the apologist’s armoury, this tactic is another way for the Christian to compensate for not being able to argue their position effectively. How many times have you been accused by a Christian on not “understanding” the scriptures as you point out questionable verses? How many times have you been told you hate a god you don’t even believe in, or that you really do believe, but simply “reject” god so you can live a life of hedonistic excess? How many times have you been charged with taking verses out of context and how many times has a Christian simply just called you names? To my mind, all of these accusations are childish and beyond desperate; ad hominem attacks or puerile copouts. Often the apologist playing the “you don’t understand…” card doesn’t realize or even consider that they might actually be dealing with an ex-Christian, and if this is pointed out, they will often change tack by claiming that person was never really a “true Christian” in the first place. The use of these sort of tactics are usually the first indication that the person you’re speaking to is completely beyond reasonable discourse and is probably too arrogant to consider they could ever be wrong about anything. Of course it would be negligent of me to compile something like this while omitting the good old fashioned Straw Man. This one, in my opinion is similar to the diversionary tactic mentioned earlier, only this time, instead of changing the topic altogether, the Christian using it deliberately twists their opponent’s words. As a result “We don’t know how the universe was formed” becomes “Everything came from absolutely nothing” and asserting there is no absolute, objective basis for morality is turned into an appeal to nihilism. This is a very deliberate tactic, which shows just how dishonest and unscrupulous the believer using it really is. You can’t help but think they know they are misrepresenting you. 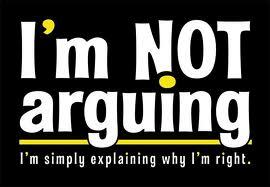 They know they cannot actually argue against what you’re really saying, so they have to put words in your mouth. It is probably one of the lowest and dirtiest weapons in the apologist’s armoury and should be roundly called out as soon as it is unsheathed. Apparently, Christians were not privy to the memo, which states that it is the responsibility of a person making an outlandish claim to prove that claim true. Frequently, Christians try to argue that not being able to disprove their assertions automatically proves them by default. In one particular discussion with a Christian, I was challenged to prove the bible wasn’t the word of god. He seemed to be of the impression that my initial scepticism of the bible and its god meant that I had to prove it false in order to have an argument, and not being able to do so made it true. Christians love this tactic as they think it gets them off the hook. What they frequently miss is that a theist of another religious persuasion could use the same argument against them. Imagine a Muslim asking a Christian to prove that Allah wasn’t real and the Koran wasn’t his inspired holy book. That same Christian would no doubt insist (somewhat hypocritically) that the burden of proof was on the Muslim. However, the biggest problem here is that even if it were possible to prove a negative, even if somebody could provide rock solid proof that biblegod didn’t exist, it is highly unlikely that a Christian would accept it anyway. After all, Christians pride themselves on faith in the unbelievable. Noted apologist William Lane Craig smugly boasts that he would persist with his beliefs no matter what because his feelings provide veracity. Christians the world over continue to deny the facts of evolution and cling instead to ridiculous tales about talking snakes, a young earth and a global flood in spite of the overwhelming proof that none of it is real. So, there really is nothing anyone can say to someone who chooses to believe in things that aren’t true that could change their mind. In essence, when a Christian uses this tactic, they are simply trying to silence you. They are not at all interested in facts or evidence (which is already apparent by their beliefs) they just want to stop you from challenging them. Which leads nicely into the next weapon in the apologist’s armoury. This particular debating angle proves there are no depths too low for Christians to sink. For those not familiar with presuppositionalism, it is the bald-faced assumption that the bible is the infallible word of god simply because it says it is, and that everything stated within is unquestionably true as a result. It is essentially faith taken to its absolute conclusion. Presuppositionalim makes no apologies for its circularity since it believes with complete certainty that it is operating from a position of absolute truth. The presuppositionalist believes god (that is, a voice in their head), gives them direct revelation concerning the truth and as god supposedly cannot lie, everything they think is therefore true. According to the presuppositionalist, god created everything and knows all things, so it is IMPOSSIBLE for anybody to question god or critique Christianity in any way because their logic and ability to reason comes from that same god, and since humans don’t know everything (only god does), they can’t ever be sure with any certainty that anything they think they know is even real. If you are new to this argument and it hasn’t made you want to headbutt your keyboard, then you’re doing better than most people. Presuppositionalism represents the very nadir critical thinking. It is wilfully and proudly anti-intellectual and gleefully absurd. It is also great for people who aren’t very smart as it tries to prevent the sceptic from even making an argument. It is a bit like someone playing chess by arranging the pieces on the board in such a way that they win before the game has even started and then claiming this arrangement proves they are the victor. The Christian using this argument is basically saying, “Let’s suppose I’m right, which I am, that means you can’t say I’m wrong because I’m not, therefore god exists and I win!”. Shockingly, Presuppositionalism has actually caught many a sceptic off-guard in debates by virtue of its sheer stupidity. This has mistakenly lead Christians who use this tactic (amateur apologists Sye Ten Bruggencate and Eric Hovind being two notable examples) into thinking they have something of a silver bullet argument against non-believers. The reality is, people can’t quite believe what they are hearing. I have seen a few rebuttals to Presuppositionalism that, in my opinion over-complicate the issue and give it more gravitas than it deserves. To my mind, the presuppositionalist position falls at the first hurdle; they can “presuppose” what they wish, but cannot tell me what I can and cannot accept if they have no proof to offer. As the late Christopher Hitchens once said, “That which can be asserted without evidence can be dismissed without evidence”. I have saved the most commonly used apologist weapon until last. You CANNOT escape this one tactic, which pretty much guarantees that the Christian using it has completely lost the debate. This one is usually deployed as a final parting shot before the Christian runs away. When all else fails, when the logic is too solid to deny and the arguments impossible to dance around, it’s time to let the other person know that they will be the ones roasting in hell FOR ALL ETERNITY. But it’s OK, since you’re a kind and compassionate soul, you’ll pray for them. Pray that they’ll come to see the world as you do and agree with your delusional wittering. Yes, Christian, that’ll learn the dirty atheist. Threaten them with eternal torture at the hands of your all-loving god in a place that you don’t even know for certain even exists. So there you have it. Christian debating tactics in a nutshell. As before, there is no doubt you’ve encountered all of these at some point, as they are widely used by Christians in defence of their beliefs. It’s almost laughable to think that these approaches, which would be completely unacceptable in any other form of discussion are employed relentlessly by Christians trying to argue for their faith. It should be clear from everything I have presented here that Christians are generally not interested in an open, honest discussion of the facts, they merely wish to protect their house of cards and will do anything to prevent you from blowing it down. When I realised I was slowly falling away from the fold, I looked for anything to reinforce my dwindling beliefs and these were the kind of arguments I’d see being trotted out by apologists. Coupled with the outright lies I would often hear Christians peddle to support their beliefs, it really made me stop and question everything. If god was real and Christianity was true, arguments like these wouldn’t be at all necessary. After all, nobody needs to rely on elaborate sophistry to prove that the sun is real; all one has to do is point at it in the sky. The fact that Christians needs to go to these lengths to try and validate their position shows that they don’t have one.